Your organization has made the decision to dip their toe in social media or to ramp up current efforts. Social media in its various platforms is a wonderful way to connect with your supporters and to participate in the conversation around your mission. To follow are a few things to keep in mind as you start to consider your strategy. 1. Social Media is at its heart, SOCIAL. Think of social media (whether it be Facebook, Twitter, Instagram, Pinterest, Google+) as a digital version of an in-person networking event. Most people wander about, drink in hand, looking to find an interesting conversation, to connect with people they may not have seen for a while. They are looking for person to person contact, not person to business contact. The largest amount of time is spent engaging in small talk and catching up. Typically, there is only a smattering of business sprinkled in. People tend to move away from a person that is there to market himself and not to participate in shared conversations. The person who is perceived as the most engaged is often the person who speaks the least, who occasionally offers a question to keep the conversation going. Individuals will be following you because they are engaged with your mission and because their connection with your organization will allow them to express something about themselves and their values. Understand that they don’t need to be marketed to. In following you, they’ve already expressed that they “get” you and understand your mission. They want to see things that support their own values and will tolerate the marketing speak only if you are working on the rest of the relationship as well. Keep that in mind as you plan your posting schedule. A general rule of thumb is to balance at an 80/20 ratio. 80% of your posts should be interactional (graphics, conversational questions, tips and tricks…) and 20% of your posts can be transactional (request for donation, event attendance, purchase). 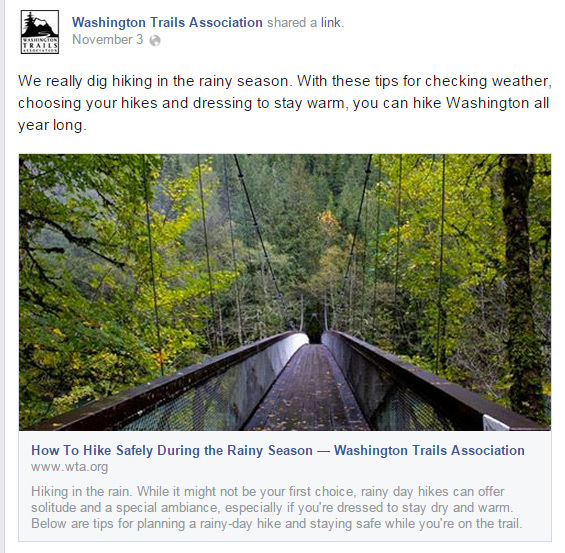 I follow Washington Trails Association on Facebook. Every day they post wonderful photos of trails I haven’t explored, tips on how to prepare for hikes, photos of animals we might see out on the trails. Periodically, there are posts about volunteering to help fix up a trail or donate towards their organization. Because I so enjoy the other posts I am fine with the little bit of business tucked in. More importantly, because they’ve given me the gift of tips and beauty in their posts, I am more likely to volunteer or donate because I feel connected to them through their other posts. 2. Social Media is not just Facebook. So many people think only about Facebook when they talk about getting into social media outreach. While Facebook is user-friendly and most of us are on it, it may or may not be the ideal platform for your particular branch of non-profit. Social media encompasses a wide variety of current platforms and will likely include many more into the future. Each platform appeals to a different subset of people. At the Petco Foundation, we found that people connected the best on Facebook and Twitter. With Pit Bull Rescue San Diego, we cultivated a good following on Instagram, while Facebook worked well for general messaging. Pinterest may be a wonderful platform for a health-based organization to share recipes or for a children’s non-profit to share child’s crafts. B2B organizations might consider a LinkedIn outreach. So how do you know what platform to focus on? One idea is to add a poll to your web site or send out an email to your existing supporters requesting feedback. Which platforms do they spend time on? What sort of topics or imagery would they want to see on this platform? What other topics are they interested in? For example, you might be a non-profit that focuses on organic nutrition. Maybe your supporters like to see recipes, farming methods, or political agendas? Also look at what your competition and similar organizations are doing. Subscribe to their social channels. Pay attention to your gut reaction to the types of things that they put out there. What types of messages do they put forward on various platforms? Look at the number of likes/comments/shares/retweets. If you have a relationship with a similar organization, ask to chat with their social person. Pick their brain for things that work and don’t for them. Almost every non-profit had moments at their inception where a small group of people came together with a passion in their soul that they wanted to share. Successful organizations still have this core of people who are excited about the mission. This excitement, this passion, this commitment is the voice that will echo the most richly throughout the social media platforms. Social media gives people the opportunity to be your brand ambassadors, to embrace your excitement and help more people to find out who you are at your core. People resonate with positive messages. Try to make the bulk of your posts about the excitement, the successes, the goals. Given the social aspect of the platform you are on, people will tire of a messaging strategy that constantly brings them down. Of course, you might be angry about injustice, but your organization is working to change that injustice. Show people the change you are working towards. Consider the ASPCA messages with the sad pets in the shelter. They are powerful, however most people say that, once they’ve seen them once, they will mute or skim past them after that first time. The ASPCA also has a balance of messages that are profoundly uplifting, showcasing people who help animals in need. Personally, I’ve seen far more of the uplifting messages shared on social media. They showcase the difference that their supporters can make. There may be a negative aspect to your mission, but at your core, is there a positive outcome you are working towards? Allow people the opportunity to grab that communal outcome and feel a part of the change you want to see in the world. 4. Don’t fall victim to the numbers game. Which would you rather have – a huge number of supporters who don’t engage with you or spread your message or a smaller number of supporters who interact with you every day and make it easy to provide engaging content because they tell you what they want through their interaction? Certainly a for-profit venture might want to have more people see their products. More eyes often translate to more sales. Non-profits, however, should seek to engage their followers. More engaged followers often translate to enhanced conversations on your page and perhaps donations in the larger picture. Note that social media is historically not a great direct fundraiser. Your goals should include encouraging people to virally share your message and your mission, not necessarily generate direct fundraising. 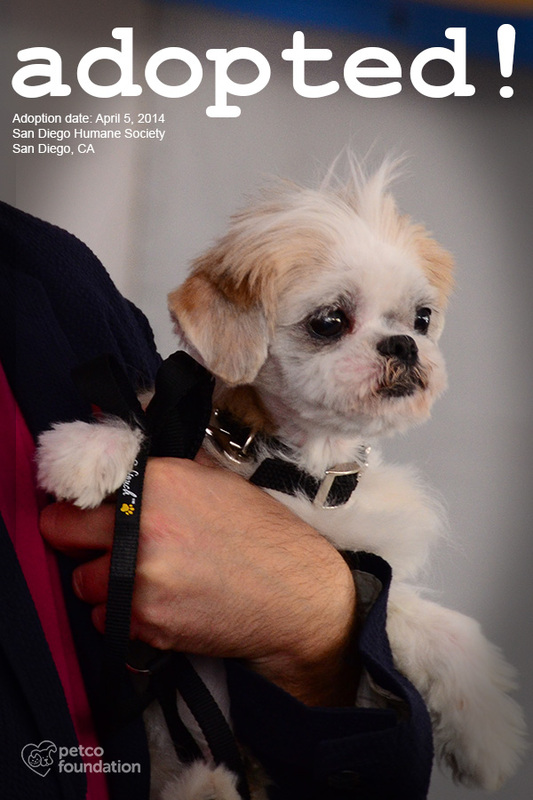 When I worked with the Petco Foundation we often ran contests on Facebook and Twitter that were aimed at engaging the followers that we did have. These contests gave them the opportunity to be our brand ambassadors. Our engagement numbers (the number of people who not only saw but liked, commented, retweeted or shared our content) was often at 25% or 30% of total eyes on a particular post or tweet. This compares to engagement numbers for organizations with millions of followers that struggle to achieve 5% engagement. What worked for me, or what worked for any number of other social media marketers, is not necessarily what will work for you. Follow the advice. Follow your gut. Follow the trends. Then, look at the data to see what works for you. Each platform has built-in tools to look at how your posts are performing. In addition, there are many pieces of software running from free to very expensive that will help you analyze your data. Whatever tool you use, spend some time each week looking at the posts that you’ve made and how people are interacting with you. Decide in advance what is important to you – likes, retweets, comments, favorites, shares? How did each post help you accomplish your expressed goals? Try more of the ones that perform well. Try them at different times of day or different days of the week. 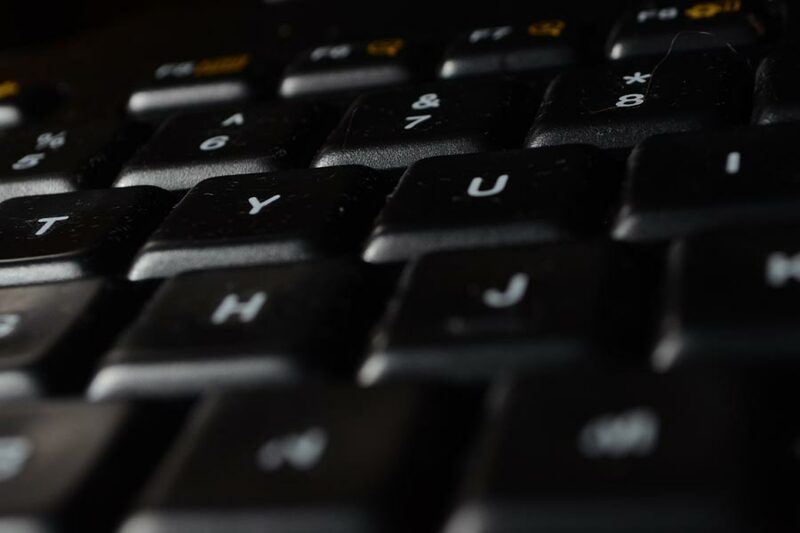 Look at whether there is a pattern to how people interact with your content. Do this continually. Algorithms change. People lose interest. Posts get stale. Adapt, using the data to guide your decisions. What has worked for you? I would love to hear what non-profit arena you are in and what platforms and types of posts/tweets that have served you the best. Post below and help your fellow non-profitters to move forward with their plans. This entry was posted in Non-Profit and tagged non-profit, social media. Bookmark the permalink.